You know from my last post that I love Christmas, and while the day itself might be over, the Christmas season is not. Here are the Copenhagen and Christmas market pictures I promised to draw out the season a little more. No trip is complete without snow! Christmas is a really important rime of the year for me. It was always my favorite holiday, ever since I was young. 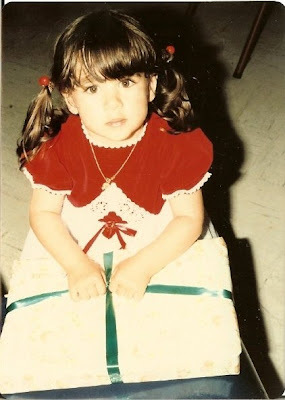 I am sure when I was young, getting piles of presents had something, if not everything, to do with it. However, there was always some part of it, a part which has increased in importance over the years, that had to do with reuniting with family. My parents, my sister and I lived in the U.S. Everyone else, grandparents, aunts, uncles and cousins all lived in Montreal. My mom is one of six; my dad is one of three. So the critical mass of my family lives in Canada. Every year we would make the 10 hour trek north, in whatever four wheel drive vehicle we owned that year. Children don’t like long car rides; my sister and I were no exception especially when our parents took control of the radio and decided it was time to play opera, which we would tune out by turning on our respective Walkmans. Over the years we found a little more area of compromise with music: some Christmas CDs like Home Alone, some 80s singers like Air Supply, and even after a long while, some opera. 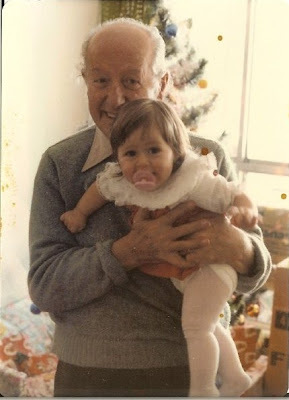 The restlessness and discomfort of the drive quickly melted away though when my grandfather or great aunt opened the door to their connecting apartments. They would usher us in out of the ritually brutal cold, walking us almost directly over to a table of bugles filled with yellow cheese, dates filled with icing, Swedish raspberries and other treats that they learned we loved. Classic grand-parenting. For many years while most of the 13 grandchildren were under, let’s say the age of 14, my grandfather and then my uncle dressed up like Santa Claus to hand out gifts. With 13 kids, it always felt like forever before he got to ours. Me age 3 or so: Can I open mine yet? My great aunt would make sure, at some point during our stay, to show us the nativity scene or to give us our own cut-out cardboard one and to remind us of the story of Christmas. This, and a short but freezing walk to midnight mass (that at some point stopped being at midnight), was her tradition with us. On Christmas Day, we all waited for the Chinese food to arrive, our Christmas feast. Saying this now, I can almost hear the gasps of horror from traditionalists who can’t imagine having take-out for Christmas. But for me, and all of us, it was just as much of a tradition as anything else. My great aunt couldn’t cook for all of us after a certain point and it was just a logistical decision. My sister and I never ever ate take-out food during the rest of the year, so for Christmas it was indeed something special. This was followed by little pastries such as tarte aux fraises and other sugar bombs and what my great aunt called white fruitcake, a raw doughy version of traditional fruitcake. I loved it. We would play our standard Christmas games, carefully organized by my great aunt and progressively by my other aunts. Paquet was always a favorite: three gifts in the middle of the table and you call out a card. The person with the card steals a paquet/package until all cards are gone and all presents have changed hands a million times. The last three cards are the ones that end up with gifts, usually three different people. Sometimes all three gifts go to one person though, and in my family this person was almost always my youngest cousin whose luck in these things is still renowned. These traditions have had over 33 years to develop and change hands, but many of them still remain and it is one of the greatest blessings in my life. It didn’t matter what would happen that year in terms of other life events: ostracizing at school, failures at work, even the loss of people who would have been there that Christmas. Despite all of these, our family has hung on, together, adding new people with marriages and births, with friends who became like family, with new boy and girlfriends who may or may not be there for future Christmases. Our traditions and reunions remain. So Christmas for me is a time when everything feels happy and miraculous for awhile. Life is full of the love it should normally be filled with and nothing else matters. That in it of itself is a bit of a miracle. I know many people may not have that experience of Christmas, or may have no experience of Christmas, but I sincerely hope that all of you have those miraculous moments. I don’t think I will post much else before the holidays, but to end on a less serious note, I will post pictures of my latest trip to Copenhagen. Maybe with the story above though, it will be clearer why I was obsessed with the idea of celebrating Christmas by going to the Christmas markets. (...I also really like gluhwein.) Stay tuned. I have noticed that living in certain places, you end up setting boundaries around your own personality. These boundaries sometimes shift when you move, so whereas in one city you are an outdoor runner, in others you are a swimmer or a gym-goer. In some cities, an avid driver, in others a cyclist. Cities and their culture help you explore various aspects of your own. You never used to eat fish and then you move to a city by the water where the seafood is out of this world… there are endless examples. I think you would have to eat seafood living in Hanoi! Too good! Rome has opened my boundaries and brought out some great things in me. Here, I am a bi (tri)-linguist. I am an avid walker. I am a stickler for fresh produce and bread. And despite the ever-present carb-loading possibilities, I have always been at my thinnest in Italy. On the negative side, being in Rome has constrained me to certain traits: I don’t drive any more. (I can’t drive manual and I get fairly obvious road rage in civilized places. In Rome, I would likely go bonkers.) I don’t rely on readily available information such as web sites because here web sites for places/restaurants are either: 1) non-existent, 2) outdated 3) so convoluted with flashing objects, pictures and multi-coloured text that you can't find what you are looking for, or 4) just flat out wrong. I don’t dance in Rome because I can't find classes to take (refer to my aforementioned point about web sites) and my clubbing excursions have waned to nothing because the music is only marginally better than what you can hear in a grocery store. When I travel, I can feel these barriers lift and other aspects of my personality tremble in anticipation of whether they might come to life again. Of course, landing somewhere you often find what barriers you may have traded for the ones lifted. However, those moments on a plane, it is a great feeling wondering how you will be reinvented, or rather reorganized, in the place you land. As I flew east to Asia, I actually felt my world expand. I had no idea how my personality traits would shuffle or what barriers I would have in Thailand and Vietnam. I had never been to this continent before. Pretty quickly in Hanoi, I realized I wouldn’t be a driver. It was literally anything goes. There were more motorini than I have ever seen anywhere. Lights were not even recommendations, they were decorations, i.e. ignored. Everyone goes through intersections at once; honking is the way to let people know where you are on the road. You honk to move from right to left, to go through an intersection, to let pedestrians know you aren’t going to stop, to pass someone, to get up on the sidewalk. Essentially, you honk for everything and therefore everyone is honking ALL-THE-TIME. It is the loudest city I have been to, Cairo, NYC, Rome all included. I wouldn’t be a driver in Bangkok either, but only because there is so much traffic that literally all other modes of transportation are faster: sky train, biking, walking... crawling. But in Hanoi and Bangkok, I think I would be the type to exercise in the parks (they have open air classes and even machines in one park in Bangkok). I would be the type to take a Capoeira-type class with a sword and fans. I would be the type to get bubble tea as a daily afternoon snack, and Thai iced coffee from the immaculately clean sky train-metro system. I would be the type to get massages, especially foot ones (Incidentally, I had never had a massage before Thailand). I would be the type to meditate and visit temples, not for my own religion’s sake, but out of respect for and interest in the spirituality of others. In short, I saw a whole other world of possibilities of what it would be like to live in Asia, and it was exciting to remember that we can be a lot more than what we are at present: habits, talents and character. We should always test our boundaries because beyond those barriers, there is sure to be more than we had imagined. Before last summer, I had never been to Positano. Since then, I have gone another three times. If you have ever been there, you know that four times to a small place like Positano is enough to know it by heart. There is a lot of awe-inspiring beauty on the Amalfi coast. The landscape is extreme and spectacular: small towns balanced off of sharp cliffs, dark blue wavy sea water, windy pin-stripe roads, beautiful beckoning sunshine. However, in this most recent trip, the feature that struck me the most however was just exactly how precarious so much of this area is. Towns are situated at the brink of a cliff or otherwise at the foot of what was once a mighty landslide. Roads are dependent on natural ledges and bridges. Churches are built at the summit of a spiky peak. Sprawling towns are laid out innocently all around the foot of an innocuous looking Vesuvius as if Pompeii had never marked history. And all this in a zone that isn't quiet, seismologically speaking. Earthquakes, volcano eruptions, landslides: these things happen. But all these millions of inhabitants live as if nothing will ever go wrong. This was not only mystifying to me, it was inspiring. You see, I have turned into a bit of a coward. A couple broken hearts, a staggering career blow, a betrayal or two, and I haven't yet lost the fear of falling. My once candid temperament has now become more taciturn; my trials have become more tempered, my emotions more guarded. How long after Pompeii was annihilated did it take for people to forget the past and move back? I try to comfort myself with the moral of Sense and Sensibility, that temperance is actually a good thing in many ways. But most of the time, I feel like I have lost a part of myself in the past. In our world though, fear is often the emotion we're taught, not courage. But perhaps a certain courage is intrinsic here... 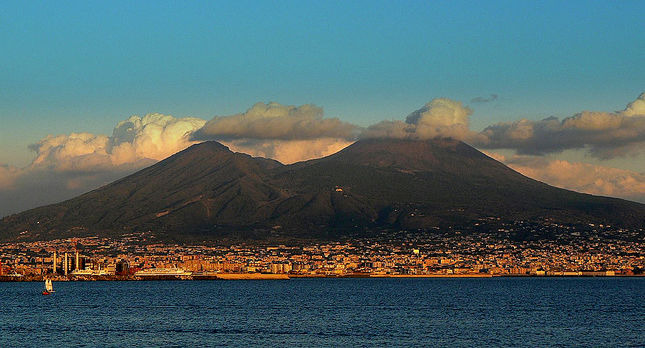 It would be really nice, like the Italians on the coast of Campania, to live as if nothing bad will ever happen. Rather than another beautiful ceramic, maybe this should be my takeaway from this past trip to Positano. Man plans, God laughs. This is a Yiddish saying, but it could have been written about planning a trip in Italy. It is usually why I am so hesitant to plan anything. It is better to go with the flow here. If I wait for a bus and it comes, great, I take it. If not, I have my walking shoes on. If I intend to go downtown, but there is a massive protest. Fine. I stay in my area. If I go to a museum and it is randomly closed on a Saturday afternoon despite its sign, OK I go shopping instead. I have learned never to be too tied to any particular plan as the chances that they will happen are about 50/50. It is a very Zen way to live in a lot of ways: to be like the reed bending in the wind. I think that has helped me a lot in life not be the controlling, rigid type "A" American that I was for many years before Italy. Every now and then though, being Zen is REALLY annoying. It like an itch you can’t scratch: never being able to rely in any sign, poster, web site or word of mouth, because they might be wrong, misprinted, outdated or simply just changed. This weekend I learned that it is particularly frustrating when you are trying to plan (the operative word) a surprise for your significant other. And not only did I, against my better judgment, try to plan something, I tried to plan something elaborate: a rental car, a weekend getaway, two different agriturismi, three different cities (Gubbio, San Marino and Urbino), ten hours of combined driving time… ambitious even by American standards. I had left very little room for buffer. Another No-No in Italy. Not only that, it was my first time 1) every renting a car (not only in Italy, but anywhere), 2) driving in the Italian country side (and only the second time every driving in Rome) and 3) driving a Smart car (the only automatic car I could find to rent). The first fifteen minutes of my rental proved how much of a novice I was in all of those things: I backed into a barrier (because what car company parks a car between two barriers in an illegal spot… Sixt); I drove around floor 6 and 7 of the parking garage 3-4 times because the signs to exit kept pointing you in opposing directions, and I ended up driving on a tram lanes/pedestrian only area because the area around Termini is so chaotic and confusing that even if there was a sign not to go there, I didn’t see it among the mess. This hazing experience, though terrifying, still didn’t deter me from my plan. And I was set for the weekend I intended. All of a sudden the cracks in my plans became evident. All the buffer zones that it lacked, all the things that could and would go wrong, all the distance we would need to travel in the short amount of time and in a slow-ish moving car. But Lake Bolsena with its tiny island in the center, the Agriturismo with its stone walled room, Chinese lantern-lit outdoor seating, lovely owners and friendly host kitty, a return to Orvietto and a drive in the countryside with a view on all of these things were all well worth the errors in my planning. So thanks for laughing at me God. I’ll admit it. You were right. As much as I travel and as much as I thought I knew about Italy (and myself in Italy), my latest trip to Sardegna (Sardinia) taught me quite a few things, many of which would have been helpful to know before the trip. Though each of us will have our own experiences, I thought I would share some hindsight on my trip in case it can serve as tips for yours. 1. Figure out beforehand whether you (and your travel companions) are beach people and plan your trip accordingly. It turns out that, though I love the sun and going and staying in the water for hours, I can't do it every day. Even with the crystal blue, perfectly temperate Sardinian waters, after about 3 beach days, I was ready for some city exploring- my travel partner, a non-water goer, even more so. Southern Sardegna in August at the Ferragosto holiday was not the best region in the world to explore cities. We were often window shopping at closed stores, reading menus of closed restaurants or wandering around empty streets... The beach: that is where the people are; that is where the action is. 2. Pack adequately for the beach, including your own lunches. Sardinian beaches, unlike most beaches in central Italy (within an hour of Rome), are not overrun with stabilmenti (i.e. more or less legal establishments that have hijacked public beaches with a pretense of renting chairs and umbrellas for your utmost convenience at the "reasonable" price of 15-35 euro). Sardinian beaches are almost all lovely public beaches. We also lucked out by having former visitors of our B&B leave behind umbrellas which we could make use of. I, however, did not bring any other beach entertainment: books, magazines, crossword puzzle, goggles, anything really. Maybe this was Ryan Air's fault with their measly 10kg rule. Or maybe it was laziness. But one comment for vegetarians, the beach bars tend to only have tomato and mozzarella panini. Go to the grocery store to add some variety to your daily lunches. Is Arutas- the little pearl beach! 3. Get recommendations from your Sardinian friends and other travelers to Sardinia, BEFORE your trip. I have Sardinian friends. I know a lot of people who have been to Sardinia. I don't know why it didn't occur to me to ask them tips until the second day of our vacation by means of Facebook. We still had enough time to take advantage of some of the great suggestions that we were given (Is Arutas & Teurredda beach were two! ), but come on! Getting suggestions from friends is out of Traveling 101! 4. Don't stop on the side of the road to observe/photograph flamingos. 5. Try the local dishes, but if you don't love all types of fish, don't be surprised if some dishes don't appeal to you. I am a fish-eating vegetarian (pescatarian? ), but fact of the matter is that I don't like a lot of fish/seafood anyway. I should have therefore guessed that I might not like cold fish marinated in vinegar and covered with nuts (burrida)... 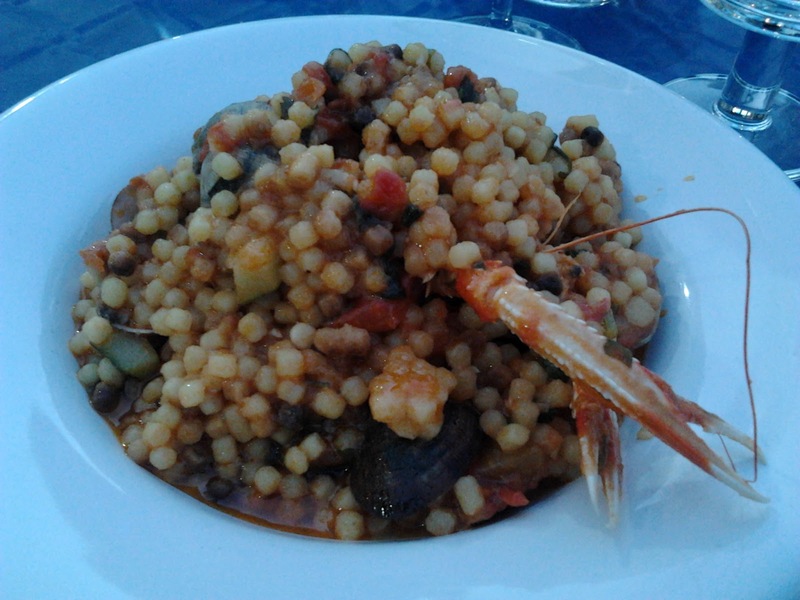 I do like couscous though, and Sardinia's version of couscous, fregola, was super yummy. Culurgiones (pasta stuffed with pecorino, potato and mint) were also exceptionally good. 6. Don't assume that Sardegna is like mainland Italy. This might have been the biggest of our flawed assumptions. Sardegna in my mind was like Sicily but wilder. It wasn't like Sicily. It wasn't like Puglia. It wasn't like Calabria. It wasn't like any one place we could think of. At varying moments throughout the trip, we compared it to Puerto Rico, Santo Domingo (DR), Novi Sad (Serbia), Romania, Spain (this one kind of made sense with the Spanish occupation) and a variety of other places. Sardegna had its own flag hanging prominently on buildings, car windows and tourist paraphernalia. It has its own beer (Ichnusa- yummy! ), even its own potato chips. Sardegna is an autonomous region of Italy. And I think autonomous is the part that is emphasized. Certainly, Sardegna is like no other. 7. Last tip: Definitely rent a car, and enjoy! Every day Rome, a set on Flickr. I may not be able to write about it every day, but I am putting my mantra of living like a tourist into practice. Every day in Rome I am taking one photo of, arguably banal, beauty. Hope you enjoy my tour of everyday Rome.